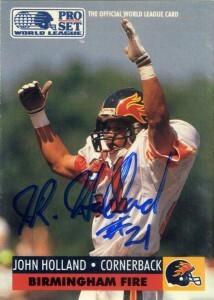 John Holland was part of the staunch defensive secondary of the Birmingham Fire that helped them make the playoffs both years of the WLAF. Originally a member of the British Columbia Lions after graduating from Cal State Sacramento in 1989, Holland was drafted by the Birmingham Fire in the 4th round of the player allocation draft. Nicknamed “JR” and “Hollywood”, Holland during the 1991 season would make 38 tackles, 3 interceptions, and a fumble recovery- good enough for second team All World Honors. He’d return again to the Fire for the 1992 season and make another interception. As the league WLAF restructured, John caught on with San Fransisco 49ers and played with them in 1993. Later that year he’d sign with Edmonton of the CFL and play with them for the next 3 seasons. (He’d also undergo a name change at some point and begin going by Robert.) In 1994 Robert would make 8 interceptions and be named to the Canadian All Star team. He’d play again for British Columbia and Saskatchewan in 1996, before returning one more time to BC to close out his career in 1997.